﻿ Raccoon Bait - What Foods Catch Raccoons? Raccoon Bait - What Foods Catch Raccoons? 05.10.2006 - This blog entry is about what bait is best to trap and remove nuisance raccoons. If you are merely interested in feeding local raccoons, please, PLEASE do not feed the wildlife. It is a lot of fun and it feels good to do, but it WILL result in animal suffering - critters dependent upon people, increased spread of disease, unhealthy animals, and starvation when the food source is inconsistent or stops. If you want to know what food to feed a baby raccoon or pet raccoon, I don't advise keeping them as pets, nor am I an expert in that matter. I'm often asked what bait I use to trap raccoons. If you want the quick and easy answer, it's marshmallows. Now, if you want to not solve your raccoon problem, leave this page right now. If you do want to solve a raccoon problem, I should make it clear that the type of bait used to trap raccoons is probably less than 1% of what goes into successful raccoon trapping. Raccoons are omnivores. Thus, they eat pretty much anything. A wide variety of baits will tickle their palates. Most of the wildlife trappers I know use a variety of foods, from wet or dry cat food, to white bread, to special raccoon trapping pastes. However, in my years in the field, I've found that they love marshmallows. Raccoons love eggs, in fact, and I think they are really drawn to the white color and shape. A colleague of mine caught raccoons with just white golf balls. 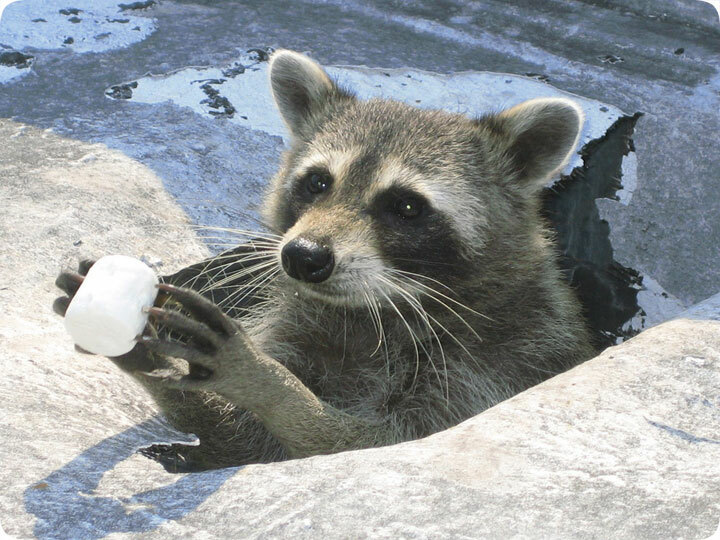 And raccoons really have a sweet tooth, so marshmallows are great. Plus they are easy to transport and store, and they are clean and easy to use. However, like I said, the type of bait isn't really that important. Type of trap, type of set, location, and a bunch of other factors are far more relevant. In addition, the mere trapping and removal of the animal is probably not what you actually need to permanently solve the problem you are having with raccooons. In fact, I've seen far more cases of problems by amateur homeowners trapping and removing raccoons than I've seen positives. Plus, trapping is illegal for non-licensed persons in most states. Click here for RACCOON TRAPPING TIPS, a guide on how to trap raccoons with many advice points. Click here for my HOW TO GET RID OF RACCOONS comprehensive guide on raccoon removal.